In addition to a GL45 VICI cap with fittings, this kit offers a safety bottle (1 or 2 liter), PFA tubing, and a mobile phase filter. 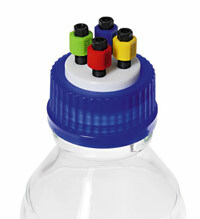 The two and three port GL45 caps are available in kits for gradient HPLC systems (up to quaternary). 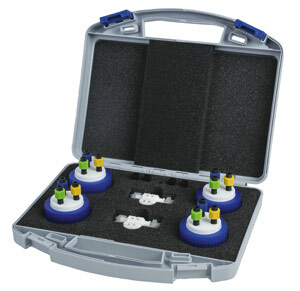 The kits include four caps, four air inlet valves, 1 plug, and a carrying case.